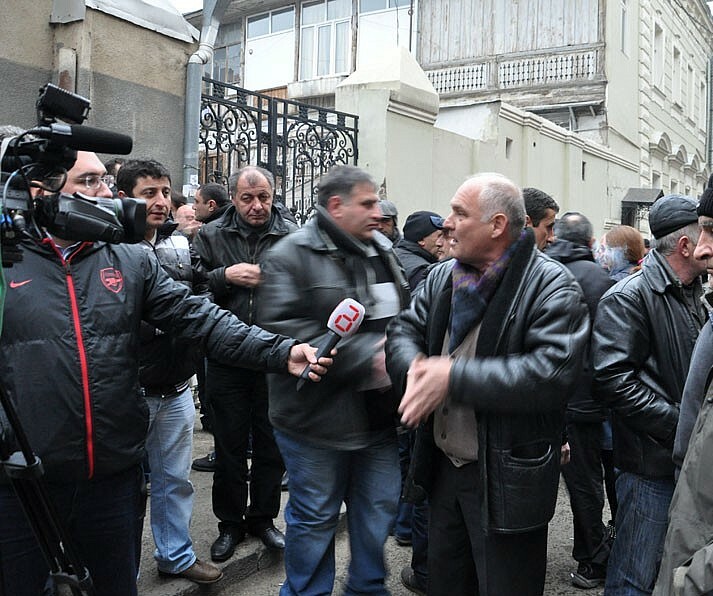 TBILISI, DFWatch — About 600 minibus drivers went on strike in Tbilisi Friday, causing crowding on buses and in the metro. The strike has the support of about 30 % of all minibus drivers in the capital. They are protesting against a new license system which has left them with little or no profit, and demand a reduction in the price of travel, to increase the amount of customers. Tbilisi has two separate networks of bus lines; one of large buses following the main streets, and a system with minivans which typically trawl through the city’s many narrow streets. The minibus system has traditionally been run by many small scale entrepreneurs. In the past, different owners used to hold different lines with different types of vans in the capital. Owners had a right to set the price of travel, while drivers were responsible for the technical needs and maintenance of the cars. Different owners of lines set the size of the daily fee that their drivers had to pay. But in the beginning of 2011, City Hall announced a new tender for one company to replace the multitude of small businesses, and as a result, the minibuses in the capital were gradually replaced by characteristic yellow minibuses run by a single company and operating under new rules. Before the change of government in October, 2012, drivers didn’t protest, but went along with the new rules. But now about a third of the drivers have decided to fight for their rights. They say they can no longer live on the reduced income they get after the system was changed. 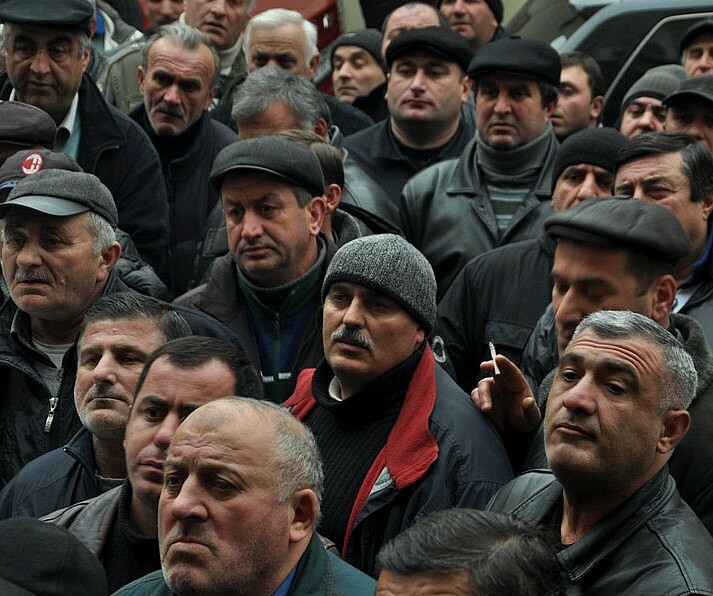 Friday morning, they went on strike and gathered in a garage in Gldani, a suburb north of the capital. The action was started by drivers on a few lines, and others joined as the drivers moved their demonstration to outside Tbilisi City Council building. Several leaders of about hundred drivers presented demands, which are to announce a new tender so that old or new owners are able to buy the lines, define their own prices and rules and have competition among minibuses. Before the tender, the average price for one journey by minibus was about USD 0.30, but now it is about USD 0.50. “We lost our clients. We do not have so many passengers that we used to, before. You have your card with advantages; you prefer to go by bus. I’m driving around with a half-empty car and still have an enormous fee to pay per day,” one of the drivers tells DF Watch. He says has worked as a driver for more than 30 years. The driver says there are about 2 000 yellow minibuses in the capital right now, out of which only about 500 have enough passengers per day to pay the fee and still have enough money left to live. But the others have a hard time. “A few days ago, I ended up with USD 3 debt, can you imagine,” another driver shouts. Elderly drivers said they remembered having about USD 600 per day, just a few years ago. “Yes, we are ready to have reduced tariff to USD 0.30 again, though petrol is still expensive. We will have many passengers, we will make more circles a day,” Amirani, another striking driver, told DF Watch. Another problem, the drivers complain, is that the new owners force them to bring their cars to a certain center for repairs, which is expensive, and they end up in a difficult situation if something goes wrong with the car. They demand to have back the old rules that let them repair their car at their own leisure. In addition, drivers want to have reduced working hours and increased salaries. The rally outside the council ended with no result and the drivers agreed to continue the strike Saturday morning. But in the evening Friday, Tbilisi City Hall issued a statement saying that this is an internal dispute between Tbilisi Minibus, the company which owns the yellow minibuses in the capital, and the drivers. “We call on both parties to start negotiations and solve the internal problems of the company, to not affect Tbilisians,” it reads. City Hall explains that the tender in 2011 was completely in line with legislation, and if the old owners of lines think it was illegal, the local government calls on them to take the issue to court, instead of going on strike.